The band have spent 2018 locked away recording their forthcoming studio album Ride To Nowhere, again mixed by the legendary Kevin Shirley. The first music from the album is set for release imminently, in late 2018, with the full album release coming in early 2019. The album will be released through Frontiers Music Srl. 2017’s Inglorious II further enhanced the standing of this remarkable band. From the body blow riffs of “Read All About It”, to the beautiful melodies of the first single “I Don’t Need Your Loving”, from the groove of “High Class Woman” to the classic feeling ballad “Making Me Pay”, it was an album that showed the bands influences stem from iconic rock and roll shrine of rock albums from the 1970s – many years before the band members were born – merged with a truly contemporary feel. Driving riffs and instant melodies all overlaid with the unique and powerful vocals of Nathan James. 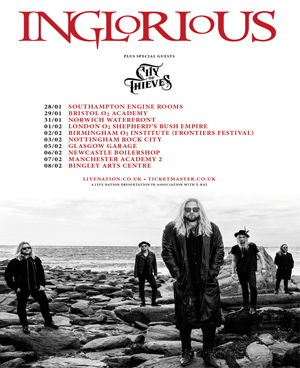 INGLORIOUS are one of the most exciting and vital UK rock acts to emerge in years. Late 2018 will also see Nathan James star in “Jeff Wayne’s The War Of the Worlds” as “The Voice Of Humanity” – he was personally picked by Wayne for the role. The version will run throughout the UK in November and December.